The annual World-Wide Mustard Competition is here! Who will be the next WWMC Grand Champion for 2019, the Grand Poobah of Moutarde? The competition is held under the auspices of the National Mustard Museum, a 501(c)3 nonprofit institution dedicated to promoting the condiment that means so much to us all. Mustards from around the world have entered over the years — from Japan, Australia, New Zealand, France, England, Germany, Poland, Slovenia, Sweden, Denmark, Ireland, South Africa, Canada, the United States, and more. 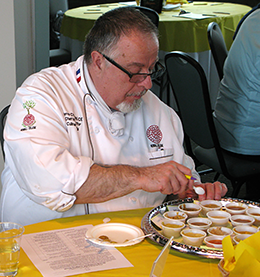 As founder and curator of the National Mustard Museum, I have been coordinating the judging of this prestigious international tasting since its inception in 1995. It is a blind tasting, so the judges have only unlabeled mustards in front of them. They do not know if they are sampling the mustard of a large international company or that of a small artisan moutardier. We bring together chefs, food writers, other food professionals and mustard aficionados to carefully evaluate the mustards. As you can imagine, it is a daunting task but one that our judges take very seriously. If you are interested in entering the next WWMC, please review the rules and category descriptions (see buttons below). If you have any questions, do not hesitate to contact me. You should duplicate the entry form if you are entering more than one mustard. There are 16 categories of mustard to be tasted and scored. You will help determine the Gold, Silver, and Bronze medal winners for each category. Examples of categories are Honey, Dijon, Spirit, Hot Pepper, and Exotic mustards, as well as mustard-based Dressings and BBQ Sauces. For the 2019 competition entries are due at the Mustard Museum no later than March 21, 2019. Medals are awarded to the top three mustards in each category and a Grand Champion award will go to the best of the gold medal winners. We will notify winners by phone or email on or about May 21, 2019. The winning mustards will also be posted on the National Mustard Museum website (mustardmuseum.com). Medals will be mailed to all winners by June 20, 2019. When do we sign up for 2018. Hello! We have recently come across your website and would love to enter the next Mustard Awards. I couldn’t find any information on entry etc on the website – are you able to please point me in the right direction? What happened to the day without mustard contest….I am a past winner and want more free mustard. Winner of the 2011 world wide competition in the Hot/Sweet catigory. Pingback: Boetjes - Welcome to the official Boetje's Mustard website - Boetje Foods Inc.
I’m a small volume producer of vinegar that is made from scratch. I make the wine and then that wine is fermented into vinegar using my static process. I have 19 International awards for my various vinegar types. I also make a mustard using my “Merlot Vinegar” which has a slight sweetness to it but no sugars are added through the process. The “slight” sweetness comes from the Merlot wine that was not fully fermented to “dry”. In which category would my mustard fall under? I hope to be able to enter my mustard in 2015.